The conch earring is a very niche piercing that has subtly grown in popularity in recent years. Celebrities such as Zoë Kravitz and Nikki Reed have been sporting this trend for years on the red carpet. If you’re looking to impress your friends with a cool piercing that they don’t have, then a conch ring is the right piercing for you. If you need information, we have everything from price to size guides and aftercare. What is a Conch Piercing? 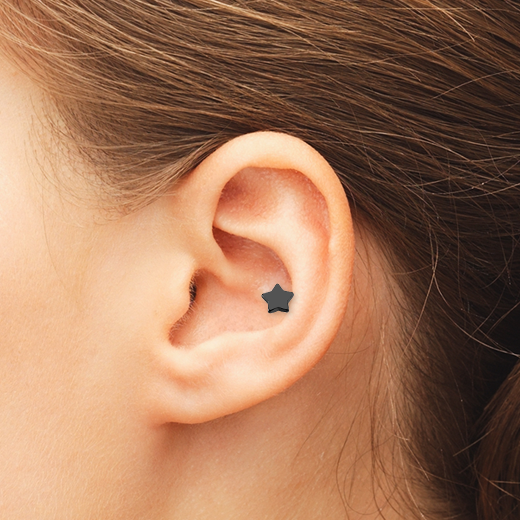 The Conch Piercing might sound like a strange body mod, but it's just another awesome cartilage earring for your ear. The name is from the ‘conch’ shell, due to that part of the ears resemblance to a shell. There are two kinds of conch piercings, which are the inner and outer conch. The inner conch is that cup-shaped area just beside the ear canal, in the centre of the ear, while the outer conch is the flat piece of the ear between the helix and the antihelix. The inner conch is slightly more difficult to get into with a needle, but it should be no problem for a professional piercing artist. Generally, a hollow 16 point gauge needle will be used for this cartilage piercing. There is little difference in this procedure than with any other cartilage ear piercing, and the healing process is also much the same. How much does it cost to get your conch pierced? The conch piercing is a specialist piercing, therefore it might cost a little bit more than the commonear piercings. This price may or may not include the cost of the jewellery which you get with the procedure, but like everything, you pay for quality. The more you pay for your jewellery, the nicer it is going to look. The price of the studio itself will depend on a number of factors: quality of the artist, the area where the shop is situated, and of course the popularity of the artist. However, like the jewellery, you pay for quality, so be sure to do your research and never simply go for the cheapest option. What piercing sizes fits my conch piercing? When it comes to a Conch Piercing, it’s very important that you know your sizes, and what you want to get, so you don’t end up with a hole in your ear that none of your favourite jewellery fits through. Here is some information to bear in mind when deciding on a conch ring or bar. Generally, you should receive a 16 gauge piercing, but be sure to ask your piercer, so that when you go to buy jewellery you will know the right size. You will be wearing the same piece of jewellery for possibly a year during the healing process, so be sure that the size is one you want, because if you don’t want a chunkier piercing, a bigger gauge may leave you with little choice. This is directly related to the quality and type of jewellery you pick. Obviously the smaller the gauge, the quicker it will heal, but then if you decide to go bigger, you will need to stretch the piercing, which will take a little while longer. Will getting a Conch Piercing hurt? Like all piercings, the Conch Piercing is going to be a little uncomfortable, as someone is piercing your skin with a needle. However, it is no different from most cartilage procedures, a little more painful than a lobe piercing, but very bearable. Of course, everybody has different thresholds of pain, so something one person finds to be a pinch, someone else may find unbearable. However, most people agree the conch piercing is in around a 4-5/10 on the pain scale. Some people prefer to get a Dermal Punch, which is when the piercing artist removes a large area of cartilage and tissue with a large gauge needle, so the person can wear flesh tunnels and plugs. This is a bit more painful but bearable. If getting this though, be sure it is what you want, as the large wound will not heal over if you stop wearing jewellery. What to expect when getting a Conch Piercing? You’re going to be talked through the procedure by any good piercing artist when getting a conch piercing, but just in case, here’s a very short guide on what to expect. - You’ll be talked through the procedure and hygienic practices. - Your ear will be cleaned with disinfectant. - The area being pierced will be very carefully marked with a surgical pen, so try not to move about too much. - The needle will be inserted through the conch, followed by placement of the jewellery. It’ll be over in a couple of minutes. - You will be given your aftercare options by the piercing artist. 1. Relax! You are probably going to have a moment of regret or panic just before you get pierced, but all the fear will have been built up in your head. It will be over in a flash. 2. Pay well! You’re paying someone to pierce your skin, so skip the cheapest options and look for quality instead, it’s always worth paying that bit extra. 3. Ask questions! Any good piercer will be happy to answer any one of your questions and put your mind at ease. It’s perfectly normal to want to know exactly what will be going on; it’s your body after all. 4. Choose wisely! Make sure you pick solid titanium piercings which you actually like because once it’s in, you can’t change it for months until the piercing has healed. 5. Aftercare! In case we didn’t mention it, be sure to follow your piercers instructions about aftercare, and look after your new piercing every day to avoid complications. 1. Use a salt spray solution to clean the pierced area at least once a day. 2. Apply the solution to a thick tissue or non-alcoholic swabstick and clean around the site. 3. Gently wriggle your piercing about to make sure the cleaning solution soaks right through. 4. Spend between 2 and 5 minutes getting rid of any pus or discharge that may appear. Only clean twice a day at most as any more may cause irritation. 5. Try to stay away from any chemicals, oils or ointments in the first four weeks of healing, but after this, a piercing healing oil product can be a real help. How long does it take for a Conch Piercing to heal? - Many piercing artists recommend getting a labret or a bar, rather than a ring, during the healing process of a Conch piercing. They are less intrusive and less likely to get caught on clothing or hair. - As well as this, touching the area (other than during cleaning) is a big no! Your fingers could be carrying bacteria which might harm the healing process. - Finally, be sure to stick to your aftercare schedule, which can be found below or given by your piercing artist. With a conch piercing, there is actually less risk of rejection than with other cartilage piercings, as the hole goes clean through the ear. However, there is the usual risk of infection as with any piercing. To avoid infections, just be sure to clean the piercing consistently. Because cartilage does not grow back, there is always the risk that too large a gauge piercing may cause the ear to ‘collapse’, due to a lack of support from cartilage. This is extremely rare, and won’t happen in with normal size gauge piercings (14/16) but it is important to know the risks involved. Have fun! Your new piercing is going to look awesome, so be sure to show it off to all your friends and family, and make the most out of it.